One of Søren Aabye Kierkegaard’s most celebrated works, Concluding Unscientific Postscript, sold 50 copies in his lifetime. Nevertheless, the 19th-century Danish philosopher was confident that history would offer him a warmer reception than his contemporaries did. The Swedes were the first to recognize Kierkegaard’s importance, followed by the Germans and the French. The English-speaking world knew virtually nothing about Kierkegaard until 1908, when a book of selections were rendered into English. In the late 1930’s, Walter Lowrie discovered Kierkegaard and together with David Swenson, awakened the English-speaking world to Kierkegaard’s significance. Howard and Edna Hong first translated Kierkegaard’s Journals and Papers into English for which they won the National Book Award in 1968. In the 1970’s, the Hongs entered into a contract with Princeton University Press to publish Kierkegaard’s Writings. This challenging project was completed in 2000 with the publication of the final volume 26, Cumulative Index to Kierkegaard’s Writings. Kierkegaard, whose name in Old Danish means “churchyard” (with all the familiar connotations of “graveyard”), was born in Copenhagen in 1813. He was the youngest of seven children born to Michael Pederson Kierkegaard and his second wife and quondam servant, Anne Sørensdatter Lund. In thousands of pages of personal jottings, Kierkegaard did not mention his mother once, and yet his journals swim with notes about his autodidact father. By all accounts, Kierkegaard’s melancholic, pious, and indisputably brilliant father left an unusually deep impression on him. Some would call it a scar. Before Søren was 21, four of his siblings, a number of relatives, and his mother had been buried. His father confided that the endless treks to the cemetery were all part of a divine punishment for his boyhood curse against God. The elder Kierkegaard announced to his remaining sons, Peter and Søren, that he would outlive his children, that he was damned “to be a cross upon their graves.” Søren believed him. Kierkegaard showed considerable intellectual acuity as a youngster, but he was remarkable only for his ability to discern a person’s most vulnerable points and then challenge him accordingly. In addition to drubbings from his fellow students, this ability earned him the nickname of “Gaflen” — “The Fork.” He would eventually make good on this well-chosen cognomen, painfully pointing out to an ever-expanding circle of readers inconsistencies between the words and works of the Danish elite and the Lutheran state church. In 1830, Kierkegaard entered the University of Copenhagen. At the behest of his father, he matriculated in theology, but he studied widely in the liberal arts. As Bruce Kirmmse suggests in his thorough study of the subject, Kierkegaard in Golden Age Denmark, the 1830’s were to Denmark what the 14th-century was to Florence. The most important literary figure of this era was the Danish playwright Johan Ludvig Heiberg. Kierkegaard attached himself to the lively coterie surrounding Heiberg. During this period, in which Kierkegaard is regarded as having been in rebellion against his father and his father’s faith, Kierkegaard was something of an academic idler. In 1837, he was reconciled with his father, who died suddenly the next year. Kierkegaard had been at the university for eight years, but despite his father’s goading, he had still failed to take his exams. Explaining that he could no longer argue with a dead man, he began to apply himself. In 1840, he passed his exams, and a year later he finished his dissertation, On the Concept of Irony: With Constant Reference to Socrates. This magisterial study, comparing the use of irony in the Romantic age with the irony of antiquity, shows the positive impress of the reigning philosopher of the time, Georg Wilhelm Friedrich Hegel (1770-1831). Thereafter Kierkegaard’s attitude toward Hegel would take a turn for the worse — much worse. In 1837, when Kierkegaard was twenty-four, he had met and fallen in love with the fourteen-year-old Regine Olsen. Just over three years later they became engaged. Almost immediately after the engagement Kierkegaard began to have second thoughts. Thirteen months later he broke it off. 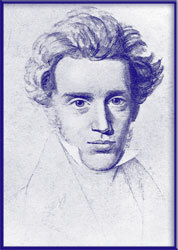 Kierkegaard’s writings sometimes suggest that the reason for the break was his desire to protect Regine from the terrible melancholy that afflicted much of the Kierkegaard family, himself and his father emphatically included. In other journal entries, he stated that he simply could not at the same time serve both Regine and the Idea. He was probably right about this. Regine eventually recovered from the emotional trauma and married another suitor. Kierkegaard, however, never got over her. She was the wife of his soul. His father, to whom many of his works are dedicated, was never far below the lines of his thought; the same was true of Regine, but even more so. Though she never responded to the one overture he made to retain some kind of relationship, he named her his sole beneficiary. Two weeks after ending his engagement, Kierkegaard left for Berlin, where, along with Karl Marx, he attended the German philosopher Friedrich Schelling’s lectures. In Berlin, in the crucible of his rift with Regine, Kierkegaard came into his genius and his muse. In a four-month period, while taking five courses, he wrote Either/Or and Two Upbuilding Discourses. E ither/Or, in style one of the most unusual philosophical tracts ever written, went through two printings and was Kierkegaard’s only market success. Having had his fill of Schelling, Kierkegaard returned to Denmark and began a period of astounding literary productivity. Within the next three years he wrote Fear and Trembling, Repetition, The Concept of Anxiety, the sharply chiseled Philosophical Fragments, the immense though uneven Stages on Life’s Way, and a shelf of more “upbuilding discourses.” In 1844 Kierkegaard decided that after one more book he would lay down his pen and become the pastor of some rural parish. His literary finale was to be Concluding Unscientific Postscript — “concluding” because it was to be his last book, “unscientific” so as to distinguish it from the systematizing work of his antagonist Hegel, and “postscript” relative to the Philosophical Fragments. Yet as fate, or something higher, would have it, Kierkegaard’s career as an author was far from over. Throughout his writings, Kierkegaard often returned to the theme of inderlighed, or “inwardness,” which in its most developed form is nothing other but nothing less than Christian faith. Hegel, as Kierkegaard read him, believed the individual to be the sum of his or her outward manifestations: one is what one does. Kierkegaard, however, repeatedly insisted that the inner person and outer actions are incommensurable. Something within each of us can never be given direct outward expression. In Fear and Trembling, Kierkegaard offered his famous sketch of the Knight of Faith. Outwardly nothing about him is remarkable. He appears to lead an impeccably normal life, and yet he is possessed of an inwardness rarer than the genius of a Mozart. In the history of ideas Hegel and Kierkegaard are forever locked in mortal combat, with Kierkegaard defending the sovereignty of the individual against the Hegelian notion that the significance of the individual derives from his or her participation in the universal or collective. Like the latent content of a dream, this conflict perpetually finds new forms of expression, the most recent of which has been the ideological struggle between Marxism and Western individualism. Still, the gravamen of Kierkegaard’s charges against Hegel focuses on Hegel’s influence on matters of faith. So far as Kierkegaard was concerned, Hegel—whose cultural influence was both broad and profound—has subjected faith to a fire sale. To Hegel, religion was philosophy made simple. In comparison with the intellectual demands of philosophy, the faith of an Abraham was not only simplistic but also second-rate. Kierkegaard once said that he wrote to make life more difficult for people—to dispel the delusion that faith was easy. He wrote to make faith difficult and thus possible again. Not surprisingly, Kierkegaard liked to think that he, like the Knight of Faith, led an outwardly ordinary life. This was not entirely true, however. In December of 1845 he launched an attack on a popular Danish weekly, the Corsair. This paper, founded in 1840, was an important component of the liberal opposition to the monarchy. Nearly everyone read the Corsair, and many feared turning up in one of its very popular political cartoons. The paper, which Kierkegaard rightly considered to be something of a rag, responded to his broadsides with a torrent of articles and personal caricatures. Kierkegaard soon became a negative media star—or, as he put it, “a martyr of laughter.” The man who so much enjoyed walking the streets of Copenhagen could no longer make his rounds without attracting a crowd. By the end of the following year the battle was over. The editor of the Corsair resigned, but Kierkegaard’s private life was never the same again. In 1849 Kierkegaard published his magnum opus, the Christian psychological masterpiece Sickness Unto Death. This study of despair was published under the pseudonym Anti-Climacus. Kierkegaard wrote many books under noms de plume, each with its own perspective and style. He seriously considered publishing Sickness Unto Death under his own name, but decided against it because he didn’t think he lived up to the ideals espoused. Sickness Unto Death was written from the perspective of a Christian physician at the deathbed of culture. But by his own standards, Kierkegaard was only “becoming a Christian,” so how could he justify signing his name to ideals that were nothing more than possibilities for him? Can one imagine a contemporary ethicist using a pseudonym because he could not honestly say that he expressed his ethical ideals in his daily life? Kierkegaard was a virtuoso of self-scrutiny. Many have observed that we are living in an age when pastors speak as therapists and therapists as bishops. In Sickness Unto Death, Kierkegaard did us the exquisite service of distinguishing psychological modes of self-understanding from religious categories. Thus he drew a distinction seldom made today between depression and despair. Whereas depression is a quality of the mind-body complex, often stimulated by external factors, despair is a self-perpetuating sickness of the spirit or self. To be simultaneously happy and depressed is, of course, impossible, but, according to Kierkegaard, happiness and despair often coexist. Indeed, as he described it, the most cherished hiding-place of despair is none other than “the heart of happiness.” One of the defining symptoms of despair is a lack of consciousness of being a self or spirit. One can be a wizard of introspection, an expert on one’s emotional life, and remain totally “unselfconscious” in the Kierkegaardian sense. Consciousness of the kind Kierkegaard tried to raise requires conviction—the conviction that one is a self. Clearly, where despair is the illness, rejecters of selfhood have a poor prognosis. If only indirectly, Kierkegaard counseled that self-consciousness is conditioned by our wider system of beliefs: to be awakened in Freudian terms is to be in slumber according to Marx, and to be conscious according to Marx is to be comatose according to Kierkegaard. In Sickness Unto Death, Kierkegaard conclusively demonstrated that “depth psychology” does not necessarily depend upon psychoanalytic premises. If you can commit yourself to reading only one of Kierkegaard’s books, Sickness Unto Death ought to be the one. In 1851 Kierkegaard began a period that is widely regarded as the black hole in his life. Though he continued his journal writing, he published very little and led an increasingly isolated existence. In 1854 Bishop Jacob Mynster, who had long ministered to Kierkegaard’s family, died. At his funeral, Kierkegaard’s former teacher Hans Martensen referred to Mynster as “a witness to the truth,” one “of the whole series of witnesses to the truth which extends through time like a chain, from the days of the Apostles to our own day.” Given Kierkegaard’s rationale for publishing Sickness Unto Death under a pseudonym, one should not be surprised that Martensen’s hyperbole exhausted Kierkegaard’s patience. For Kierkegaard, being a witness to Christ meant imitating Christ—that is, undergoing suffering, humiliation, and isolation for Christ. As the bishop of Zealand, Mynster lived a life of prominence and luxury. According to Kierkegaard’s criteria, this was not exactly bearing witness. Martensen’s exaggerations were, Kierkegaard judged, just a logical consequence of the cheapening of religion that had long been underway in Hegelianized Christendom. Kierkegaard now launched an attack on the Danish State Church. He demanded that Martensen explain in what sense Mynster had been a witness. After a feeble response Martensen tried to stonewall Kierkegaard, but to no avail. Kierkegaard started his own journal, in which he published broadside after broadside detailing the ways in which the institution of Christianity was leading people away from lives of Christian conviction and authenticity. For the first time in his life Kierkegaard stopped attending services, and he encouraged others to do the same, explaining that by staying home people would have one less sin on their souls, since they would no longer be participating in a process that “made a fool of God.” On September 25, 1855, he delivered his last fusillade. A week later, after having spent what little remained of his inheritance, Kierkegaard collapsed on the street. On November 11, at the age of forty-two, he died from causes still uncertain. The influence of world-historical thinkers waxes and wanes, but interest in Kierkegaard is currently high. Though he can certainly be used as a rich resource for the criticism of postmodernism, Kierkegaard is now recognized as having anticipated a number of the signature views of this movement. Like Foucault, Kierkegaard understood that the voice of so-called dispassionate reason is usually informed by personal interests. Long before his twentieth-century brethren, Kierkegaard held that most philosophical speculation is based on the fantasy that philosophers are privileged to contemplate existence from some absolute, perspectiveless perspective. He believed not only that one could not step outside oneself but also that the attempt to adopt such a disinterested posture toward life was both a contortion and self-destructive. Thus Kierkegaard argued for and wrote a more personal form of philosophy than did almost any of his predecessors. Thanks in large part to the lingering influence of the French philosopher René Descartes (1596-1650), who condemned the passions and imagination as impediments to the truth, philosophers had long held in low repute what we now think of as the right side of the brain. An epoch ahead of his time, Kierkegaard insisted that the emotions, anxiety included, are not dumb brutes trying to blinker our natural lights. Just the opposite: they have a great deal to tell us about ourselves. Regarding the relationship between faith and morals Kierkegaard, in Fear and Trembling, offered a disturbing reading of the story of Abraham. After all, what God asked of Abraham was a transgression of the highest moral law. Today, a large segment of Amercan society fervently believes that the moral decline we are said to be experiencing directly correlates with a decline in church attendance. To those who champion faith as a form of moral therapy, Kierkegaard replies that without the right understanding there can be no right spirit. Concluding Unscientific Postscript is an argosy of timely meditations on the relation between the how and the what of religious beliefs, and it can, I think, be very usefully put into play in the contemporary debate over the nature, status, and content of Christian dogma. Although Kierkegaard made no attempt to bridge the leap of faith with a syllogism, he offered some very promising deflections of the traditional arguments against religion. For instance, Feuerbach, Freud, and others have tried to break the spell of the sacred by arguing that no shred of evidence supports the truth claims of faith. Kierkegaard, however, convincingly argued that the question of faith cannot be answered objectively, in part because objective certainty has no need of the trust that is faith. Another important article in the traditional argument against religion is that belief in God is a desperate attempt to assuage the anxiety that comes with being mortal. For Kierkegaard, however, whoever has the passion and imagination to believe earnestly that he is living, minute by minute, before his Creator and Judge is not likely to be calmed by that awareness. The percipient cultural critic Philip Rieff once remarked that Kierkegaard’s central intention was to produce guiding images of faith for an age that Kierkegaard believed was becoming fanatically secularized. Unlike any philosopher before or after him, Kierkegaard devoted much reflection to the question of how to communicate moral and religious truths. He concluded that, with very few exceptions, such truths cannot be broadcast and memorized. Very few philosophers, to put it in Kierkegaard’s own terms, could “move the waters of language” as he did. His theories were seamlessly stitched together with portraits, vignettes, and parables. On one page Kierkegaard constructed a rigorous philosophical argument, and on the next he fleshed out his abstractions with a character such as the Knight of Faith. Where Kant communicated a moral ideal, Kierkegaard provided a deep sense of what it means to live in and see through such an ideal. Like Freud, but with different categories up his sleeve, Kierkegaard had a profound psychological appreciation of the internal forces with which every moral and spiritual aspirant contends. In Sickness Unto Death, Kierkegaard taught that most of us try all our lives to talk ourselves out of our moral and religious knowledge, because we do not want to be led to the sacrifices this knowledge commands. Kierkegaard tried to keep us from such acts of repression. Kierkegaard is one of a small cadre of philosophers who can be read for the sheer delight of their words. But such praise would ring hollow to this philosopher-poet. On the final page of Either/Or, Kierkegaard wrote, “Only the truth that builds up is the truth for thee.” Unlike other philosophers, Kierkegaard recommended himself as an edifying author, an anachronistic idea if ever there was one. And yet this is precisely how he should be regarded—as a thinker of supreme substance who could write like an angel.